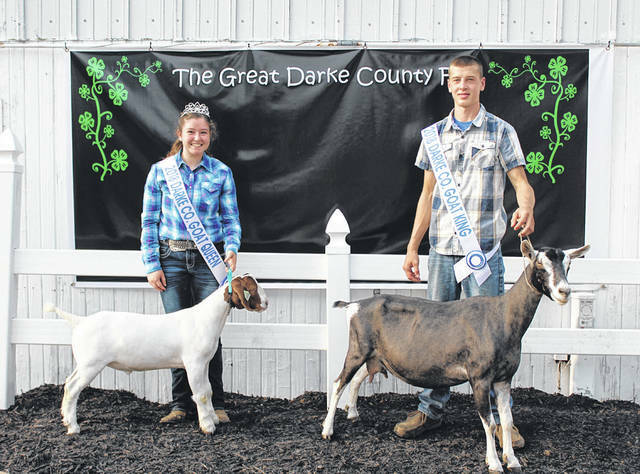 Levi Barga and Amelia Price were named 2018 Goat Prince and Princess at this year’s Great Darke County Fair. This year’s Darke County Fair Goat Queen and King are Christyana Roberts and Noah Barga. 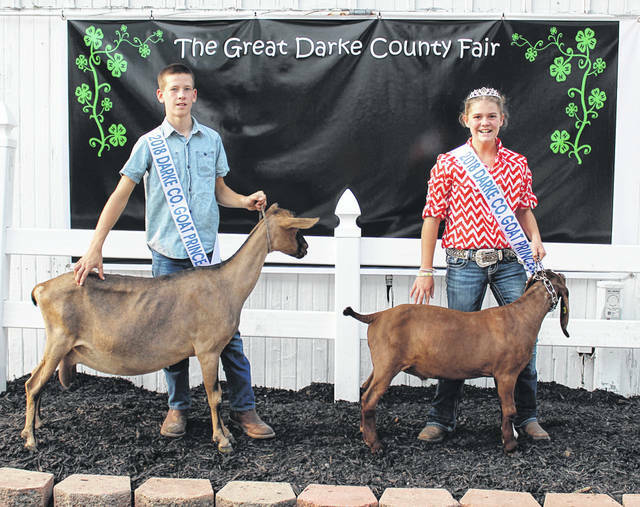 DARKE COUNTY — The 2018 Goat King, Queen, Prince and Princess were crowned Saturday night at the Great Darke County Fair. Noah Barga, 15, of North Star, was named this year’s Goat King. A member of the Patterson Patchers 4-H Club, Noah is the son of Gwenn and Michael Barga. Christyana Roberts, 16, of Greenville, was named Goat Queen. A member of the Kountry Kids 4-H Club, Christyana is the daughter of Tabetha and Dennis Roberts. Levi Barga, 12, of North Star, was named this year’s Goat Prince. Levi is the son of Gwenn and Michael Barga and a member of the Patterson Patchers 4-H Club. Amelia Price, 12, of New Madison, was named Goat Princess. The daughter of Geneva and Tony Price, Amelia is a member of the Kountry Kids 4-H Club. This year’s Goat Royalty was selected by the 2018 Darke County Junior Fair Queen Morgan Heitkamp and Junior Fair King Kyle Wuebker. Assisting in judging were King and Queen Second Runners-Up Faith Wilker and Ross Dapore. The Darke County Fair continues through Aug. 25.